WalkerSport ARDS Instruction information and prices. 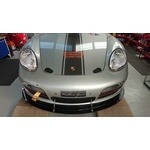 Porsche Boxster 3.2S instructor car complete with Fuel, tyres (inc spare set). Fully insured car* with Ards liability cover included *Excess applies. The Car is equiped with the VBox GPS and camera telemetry equipment so that we can asses and review your performance throughout the day, a memory stick with your video records will be given to you at the end of the day, we also have a intercom system so that communication is two way and clear all the times. ARDS instructor and light refreshments. Oulton Park, Anglessey, Donington £1500 + VAT. Brands Hatch, Knockhill £1750 + VAT. *Insurance excess of upto £1200 (maximum) applies to all damage. 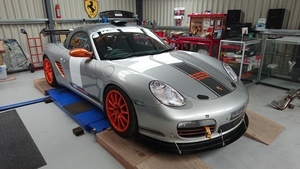 The WalkerSport Porsche Boxster is a fully race prepared car which is eligible for the Porsche Club series, MSV-T challenge and many more events, it is fully caged with race seats and full harnesses, fire extinguisher and dual braking system. This car is very versatile, quick and prepares you for fast track driving. Please email us to before booking your trackday to check availability, we will trailer the car straight to the circuit with our day van where you can use our facility all day. A garage is advised and an open pitlane when booking your trackday. 105db compliant. Marcus Clutton, 23 years racing experience (and he's only 30) from karting through to current GT programmes. 10 seasons of endurance racing, British GT Champion in 2011 plus single seater Formula Renault racing back in 2007. A current ARDS grade A instructor, coaching private clients and helping them to achieve there goals all around the world. Tim Walker is an ARDS (Association of Racing Drivers instructor) he is classified as a professional driver and coach. 2015 Pirelli Ferrari Champion. He is an instructor at Oulton Park race circuit for a MSV. 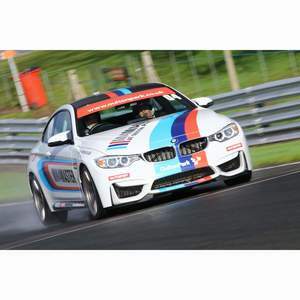 Tim can help with all aspects of driving development from car control to race development, preparation for your very first race or even speeding you up on trackdays. Moving you up the grid and posting faster lap times. 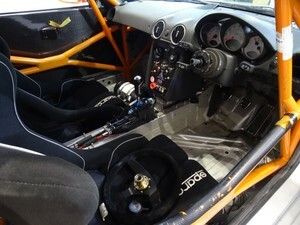 Below is a picture of our training car with Full cage, extiguisher, Race seats and Harnesses. WalkerSport are able to offer our instructors direct, So they can accompany you in your own car on trackdays or test days, please contact us for details. Talk to us to discuss your requirements.